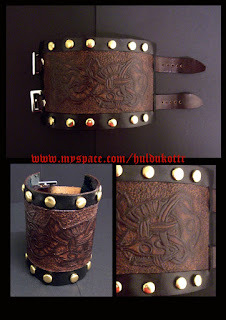 Another "archeological" bracer. Our inspirantion was the Jelling style (Denmark 10th century), with a pattern found in a brooch showing a knot shaped dragon. We must say that this kind of bracers with nailheads are made with a protection layers on the bracer's inner side, avoiding any wearer skin damage.